Local Polish American artist, Norbert C. Ostrowski is featured in a solo exhibit at the Galeria of the Polish Mission of the Orchard Lake Schools from November 4 – December 14, 2012. “Creation to Now” is the name given to this exhibit by the artist. It is a collection of paintings illuminating the spirit that ties humans and their spiritual faith together. Painted over the last 25 years, this grouping is a stunning display of color on canvas bringing stories from the Bible to life. 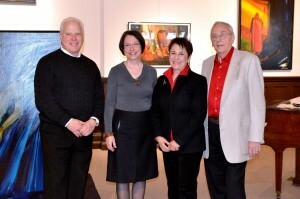 The opening reception for the artist took place on Sunday, November 4, 2012 and brought family and friends together to celebrate the art career Norbert C. Ostrowski. Born in Detroit, Norbert Ostrowski is an artist as well as a retired designer and clay modeler in the automobile industry. During his 30 year career he worked in the styling department for American Motors Corporation as well as General Motors, Chrysler, Renault and ASC (American Specialty Cars). Outside of the automotive field, Norbert is an award winning painter and sculptor whose work has been featured at the Scarab Club in Detroit. Norbert grew up with a pencil and notebook in hand. He is the oldest of seven children born into the Polish-speaking household of Conrad and Genevieve “Jean” Ostrowski. Growing up he received much encouragement for his art from his mother. A fascination with cars led Norbert to design and compete in Soap Box Derby racing. A friend of his father suggested that Norbert consider automotive design as a career. In 1958 he entered and won an automotive “Styling” design contest sponsored by General Motors Fisher Body Craftsman Guild. This scholarship helped him to attend Art Center College of Design in Pasadena, California, the primary institution for turning out leaders in automotive design. He had the unusual privilege of being accepted upon his first application to the college. He is a 1961 graduate of Art Center. Norbert’s art is primarily produced in oil or acrylic paint on canvas or art board. He occasionally incorporates newspaper and other media collage layers to reflect an era and make a statement about society. Most pieces exhibit a dominant story. Characteristic to his style are strong color blocks, angular movements that cut across the canvas and bordering shadows that draw the eye into the subject. Creating artwork with a biblical theme has been the artistic passion of Norbert since the early 1990s. He refers to this style as “Ecumenical Art” because it encompasses the themes of Judeo- Christian and Islamic traditional stories. His art is passionate and at times controversial, as his unique depictions elicit strong emotional responses. He does not care for paintings meant to coordinate with household furnishings, rather he prefers pieces that move their owner and hold great meaning to them. In the 1990’s Norbert joined the Scarab Club, a landmark art organization in Detroit, founded in 1907, adjacent to the Detroit Institute of Arts. He was involved in numerous art shows while a Board of Directors member with the Scarab Club. Norbert was Chairman of Exhibitions as well as having been a jurist for a number of art shows. He has twice received the Scarab Club’s Gold Medal award for his paintings. Norbert has also been involved with the Concours D’Elegance, a collectors automobile and art festival on the Meadow Brook Hall grounds in Rochester, Michigan. Norbert continues to paint and create at his home studio in Royal Oak, Michigan, where he lives with his wife, Marian. His sculptures and paintings are part of many private collections. His automotive design contributions can still be seen on streets today as well as preserved by collectors. A Gallery Talk will be presented by the artist on Sunday, November 25, 2012 from 3-5pm. You won’t want to miss this exhibit!